Technology getting better and Advanced Featured Now-a-days with Computers as well as Smartphones and Other I.T Gadgets. Many of us having Smartphone based on Android | iOS | Windows or any other OS but not using it fully or Using the New Features Except Camera,Music and Videos! In The Google Play Store, There are Numerous Apps made for Android rather than any other OS Smartphones. Here I am sharing Next Generation Apps i.e, Augmented Reality(AR).Many of us may be knowing of AR and How to use it well with Available Apps and their respected Markers(Usually A PDF). With The Help Rear Camera and AR Sheet we may experience Augmented Reality in better way! So Let us start with these Top 8 AR Apps available in Google PlayStore For This Month as Many of apps getting introduced in PlayStore Every Month in which Some of are Paid while Some are FREE of cost. If you have Android Powered Smartphone and having Kinda Interest in AR then you should at least give a Try to all the apps. The Augment App lets you visualize any 3D model in Augmented Reality where you may also Add your own 3D models Here. Many of Sellers use this app to Augment Business Catalogue to present their products in their actual size and better Knowledgeable and many of Brands and publishers add Augmented Reality products on top of their print content (brochures, flyers, ads…)where E-Merchants too can embed Augment in their own mobile app or site to boost their conversion rate. Want to See Martians and Martian Fighting Machines? Then You must try this app on your Android Phone or Tablet.With Using Rear camera of your device, you can see Martian Fighting, Handling and Flying Machines, and even the Martians themselves. To get thigs working you need a PDF Downloaded as it will contain the Markers set to Run AR. Ever Wondered that If you loose or Forgotten where you parked your Car? Now With this new App Never Loose your Car and have track where it is! To get Car Finder AR Working, You need Bluetooth Connection to your Car and Ofcourse GPS Enabled.You may track your car if it gets stolen too.Also this will track your Car Location and show you Nearest Car Parking too. Again A great AR app that will help you to Drive safe and Improving your Driving Side by side.As Above Apps, This also uses Rear Camera and GPS with Sensors to detect driver”s current Speed to alert Driver when they are in Danger. This app having Visual Radar with real-time calculations! This app will give an audio-visual warning pops up to alert of a possible collision, allowing the driver to brake in time. Still, iOnRoad Does Not Replace Safe Driving AND Will NOT Catch ALL WARNINGS and so Keep Your Eyes on Road and Don”t get Dependent on App! With GPS and 3D Model Making AR Apps, AR Apps for Education Purposes also Exists in Play Store like T.Rex Museum Installed Animator. With Logie T.Rex, you may unleash the AR T.Rex Visualizing them on Your Android Phone or tablet with the Different Markers Provided. Most of us may be not knowing of this App neither used it personally, but Satellite AR is Great AR App showing Positions of Different Satellites of Various categories on your own Smartphone.Just Point your phone”s Rear camera to the sky and small icons track the locations of various satellites. 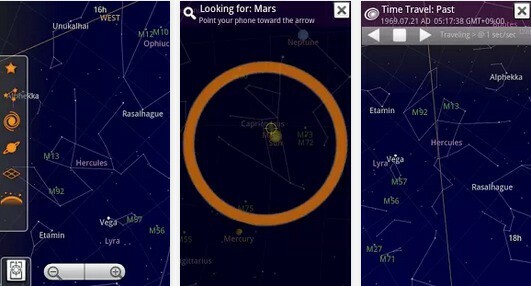 As per above App, Google SkyMap is also an AR App used to show Positions of Different Planets,Stars and Even Galaxy Too! This App have Highest Rating with Other Apps as it Works Great with Device In-Built GPS and Gyro Sensor. Those who liked SatelliteAR to track Location of Different Satellite, they will surely like This app too. Like T.Rex Educational Purpose app? Then Again Different App related to Education and Learning is Here and it is AR Solar System which Teaches About Our Solar System in a Fun Novel Way. App Shows Planet Speed and Info based on Actual NASA Data. If you planning to get Posters or any models related to Solar System then Why waste money where you get it Free Here! There are also Other AR Apps including Layer, Acrosshair, 3D Compass and All other but I Shared New Apps rather the Old Collection. Augmented Reality(AR) is Great Invention that works with Simple GUI based Application using Device Rear Camera and Other Sensors and GPS Too. Many of Vendors, Sales People using AR to make 3D Model showing Actual Dimensions while many of us Using to Demonstrate the Things and These AR works with Tags/Markers Printed on Paper! Top 7 Temple Run Like Apps !